The advanced technology of Span-America’s long term care bed recently won national recognition for creativity. 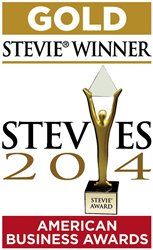 An American Business Awards Stevie Gold Award – won by Span-America Medical Systems, Inc. for its “Encore Waltzing Bed” video. Span-America Medical Systems, Inc. was presented with GOLD and SILVER Stevie(R) Awards in their selected Sales and Communications categories in the 12th Annual American Business (ABA) Awards. Winners were announced during a celebratory gala banquet June 13 in Chicago, with categories varying from management and sales to communications and media from a field of more than 3,300 entrants. Span-America’s creative promotional video dubbed the “Encore Bed Waltz” won a first place, gold award at the event. The video introduces Span-America’s Encore(TM) advanced technology bed for long term care and can be viewed on YouTube at http://youtu.be/NJavipkbX_Y or the company’s website. The imaginative video highlights the ENCORE’s state-of-the-art features, showing how solutions to some of today’s most critical challenges in resident care have been integrated into the bed’s design. Span-America Medical Systems has a more than 30 year history in the design and engineering of specialized healthcare products, such as its technologically advanced PressureGuard(R) powered mattresses for long term care. Following its 2012 acquisition of beds and furniture manufacturer, MC Healthcare Products, Inc. of Beamsville Ontario, the company entered the resident care beds market. The acquisition significantly expanded Span-America’s product lines and marketing footprint in the industry. Span-America was also honored for the initiatives by their marketing team. The team won an ABA Stevie Silver Award for the coordinated Encore bed marketing campaign which, in addition to the gold award-winning video and a 12-page musically themed brochure, includes the digital interactive 3D Virtual Bed and Bed Configurator app. The marketing team developed these online tools to provide the Span-America reps across America, and their customers – who include clinicians and corporate healthcare buyers – a virtual showroom environment in which to experience company products. Using the 3D virtual tool, clinicians can simulate the operation of the bed’s motors which put the bed through its various therapeutic positions and then – using the Configurator – select the most suitable bed model and options. Span-America wishes to acknowledge the creative contributions to the award-winning initiatives made by their service providers. The “Encore Bed Waltz” video was developed and animated to music for Span-America by the Greenville area creative house OSA Marketing DigiTeam, who also animated the 3D Virtual Bed and partnered with GrippeCreative and Digital Elixir Studios in development of the themed brochure and Bed Configurator respectively. Awards in additional categories will be announced during a gala event in San Francisco on September 12 where Span-America’s Configurator app is a finalist for another prestigious award. The American Business Awards trophies were nicknamed “the Stevies” for the Greek word for “crowned”. Winners and nominees for the 2014 gold, silver and bronze awards include several well-known companies - AT&T, Citibank, Cisco Systems, Samsung Electronics, Microsoft, Boeing Commercial Aviation, General Electric and United Healthcare. About Span-America Medical Systems, Inc.
Span-America manufactures and markets a comprehensive selection of pressure management products, beds and furniture for the medical market, including PressureGuard (R), Geo-Mattress(R), Geo-Matt(R), Span+Aids(R), Selan(R) and MC Healthcare products. The company also supplies custom foam and packaging products to the consumer and industrial markets. Span-America's stock is traded on The NASDAQ Stock Market's National Market under the symbol "SPAN".